In A Landscape Where Nothing Officially Exists, at UnSpace Ground, College Art Association Conference 2012, Los Angeles Convention Center. For this event, eight artists and one biologist collaborated to create 35 art works representing endangered species living in southern California.Â In order to spread awareness of the endangered status of these organisms, viewers were invited to sign up to take custody of a work of art, in exchange for a commitment to learn and care about the species represented, and to reproduce or represent the artwork online.Â This article is my fulfillment of the pledge that I took on that day. The format ran something like a silent auction, with viewers selecting the work and species they wanted to care for, and signing up on form.Â As the event unfolded, Jenny announced each species, artwork, and its new caretaker, auctioneer-style.Â Both Stephanie Burke and I took custody of pieces by Jenny Kendler, a friend of ours whose work we have admired for a long time.Â Kendlerâ€™s work frequently addresses issues of ecology and conservation, but what Iâ€™ve always appreciated about its soft, quiet beauty, which has always reminded me of the animated film The Last Unicorn.Â This delicate aesthetic carries through her drawings and paintings, her sculptures, and makes an important subject palatable, avoiding any possibility of being called shrill or preachy.Â It is pretty with a purpose. 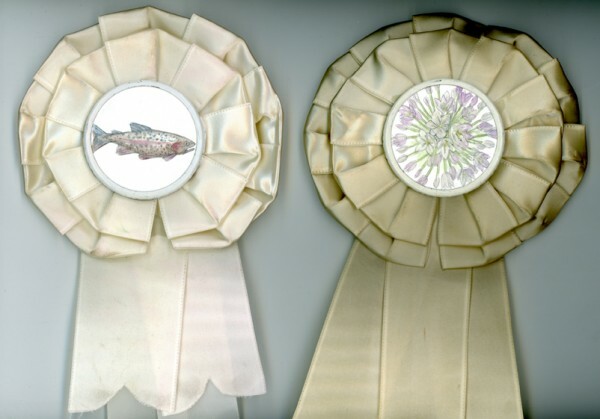 Kendlerâ€™s contributions to â€œIn A Landscape Where Nothing Officially Existsâ€ were rendered in graphite and watercolor on little circles of paper, which were then mounted on vintage ribbons, like one might get for â€œBest Pigâ€ at the county fair.Â They are similar to, although I believe separate from, an installation called â€œSelection:Â 23 Endangered Species,â€ executed in the same medium and also mounted on ribbons. Stephanie took custody of Muntzâ€™s Onion, and I went for the Southern California Steelhead Trout. Steelhead are a unique type of rainbow trout, which are classified along with salmon, char, and other trout as salmonids.Â Unlike other rainbow trout, steelhead, like salmon, are anadromous, spending most of their adult lives in the ocean but spawning in freshwater streams and rivers. The Southern California Steelhead Trout is an â€œevolutionarily significant unitâ€ (ESU) of the coastal steelhead/rainbow trout, Oncorhyncus mykiss iridius.Â Since the end of the last glacial period, some 12,000 years ago, steelhead of the southern ESU have evolved several unique characteristics uniquely adapted to the semi-arid climate of Southern California.Â Compared with northern populations, southern steelhead have the ability to tolerate warmer water, the juveniles grow faster and migrate to the ocean more quickly, and they may â€œstrayâ€ more frequently from the exact river or stream of their birth when returning to spawn. Southern California steelhead face two major threats to their survival.Â Water diversion and extraction cause many streams to dry up for much of the year, much more frequently than previously.Â Secondly, various barriers can prevent the fish from returning to their spawning ground:Â dams obviously from a major obstacle but flat, concrete-lined channels and narrow culverts can also create high-velocity â€œwind tunnelsâ€ of water which the fish are unable to pass.Â The loss of riparian vegetation, the introduction of non-native predatory fish and amphibians, the filling and destruction of estuaries, and pollution from industrial and agricultural runoff have added to the difficulties. The steelhead was listed under the Endangered Species Act in August 1997, and various populations listed as threatened or endangered.Â However, the listing excluded any area upstream of an impassible manmade barrier, leaving most of the vital spawning grounds unprotected, and inaccessible.Â Organizations such as the Center for Biological Diversity, the Audubon Society, the Friends of the LA River (FOLAR), and the California Coastal Conservancy have fought to revive southern Californiaâ€™s steelhead populations.Â Efforts have included the redesign of channels to slow water flow, provision for means for fish to get around barriers, restoring riparian vegetation, and eliminating invasive predators. There have been some major setbacks, for example in late January 2011, when the California Coastal Conservancy abandoned its efforts at reviving the San Mateo Creek population, in part because of hindrances presented by USMC Camp Pendleton.Â There have been successes as well.Â The Environmental Defense Center of Santa Barbara worked with city planners and the Army Corps of Engineers to redesign the concrete channel framing Mission Creek, slowing its flow, and adding step pools and rock weirs to allow fish to migrate upstream.Â The Matilija Coalition in Ventura County has been working to remove a dam, modify bridge structures, and restore shade trees along the Ventura River.